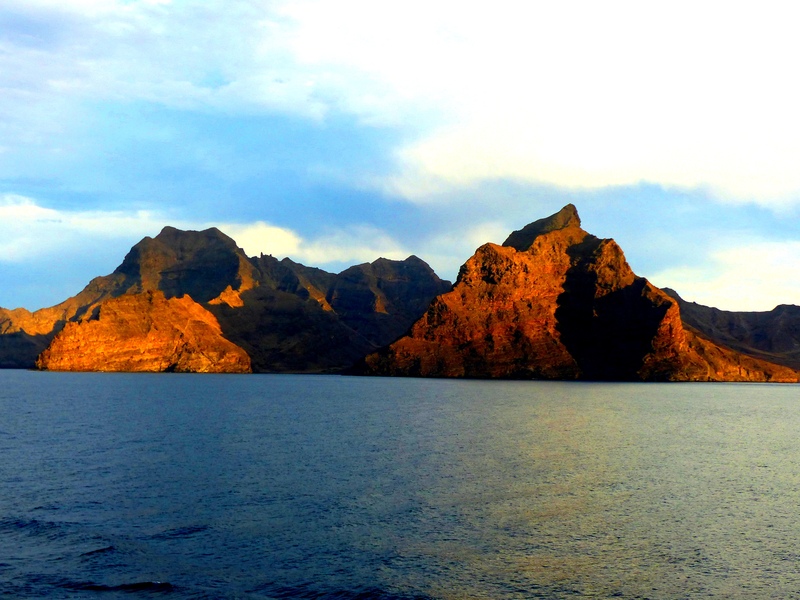 As we moved through the sea from Gran Canaria towards Cape Verde the sea became calm and the weather warmed. We were off the coast of Africa breathing African air. Its where us humans originated. I stood at the bow of the ship and breathed it in. It was early in the morning. I got out of my bunk and headed for the deck. I wanted to catch sight of the sun rising and get my first glimpse of Cape Verde. As the sun rose lan came into sight. We slowly churned through a gentle ocean towards it. The sun rose behind the volcanic island, directly behind Sao Vincente. It lit up the volcanic rock and soil into a rich orangey red. An rock island of dark hue stood out starkly in the water in front of those ridges. You could see the volcanic nature clearly. There was a natural harbour full of sheltering ships bobbing on the waves and caught in the low orange light as silhouettes as we slid into the bay. My camera clicked. There were too many sights to take in. We walked round the town and sat on the beach watching fishermen sorting nets and dragging tatty boats into the waves. We went round the fish market where women carried tubs of fish on their heads and trays of red, yellow and orange fish gleamed in trays. Fish with blue luminescent spots, mottle orange eels and brown and silver fish. Big fish and little fish. All types that I’d never seen before. We took a taxi to the top of the volcano and looked back over a dusty landscape that had its own stark beauty or reddish soil and rock, and peered down to the blue waters of the bay and the ships. Parts looked like the surface of the moon but there were some shrubs and lower down there were goats and egrets. We walked around the market and talked to the locals. We looked at the buildings with their decaying Portuguese grandeur and peered at the blue tile-work depicting the scenes of the beautiful town it used to be. What had once been pristine with splendour was now settled into a shabby chic. We walked round the fruit market in its splendid building. There were tiles depicting women that looked like they were Picassos and scenes of the women carrying baskets of produce on their heads. 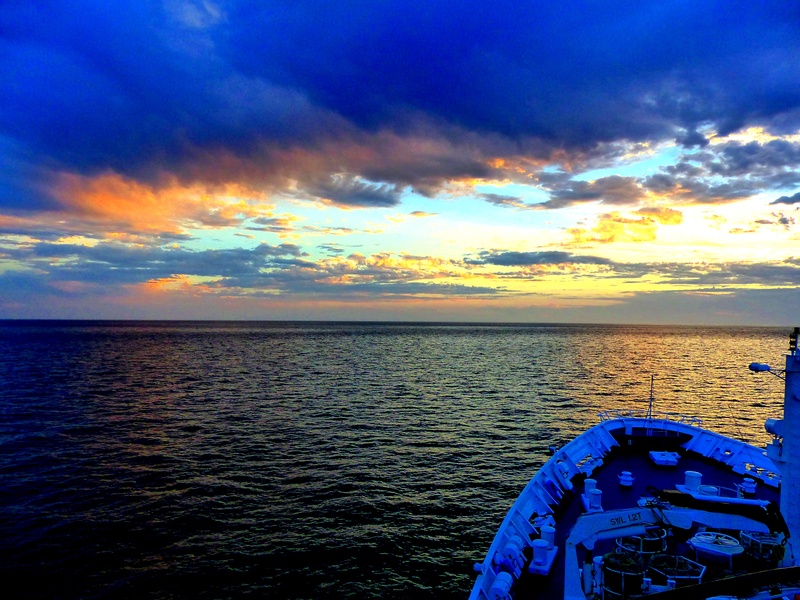 Back on the ship it was time to head out across the Atlantic for four days in the doldrums. 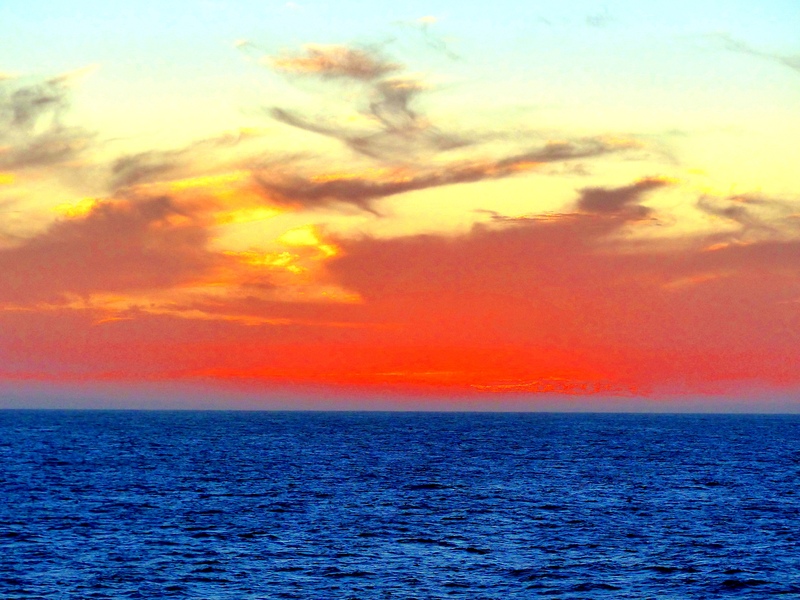 There were sunsets, flying fish, whales, turtles and seabirds to look forward to. I sat at the bow with a beer and watched the volcanic cliffs slide into the past as the sun shone the orange light of sunset upon them. What was ahead had to be outstanding to match what had been.